I've been a Wilmingtonian for 20 years, and a die-hard lover and supporter of all things fun, lively, artsy and nightlife-y in our fair city (and our State). The folks at Out & About magazine have me beat. 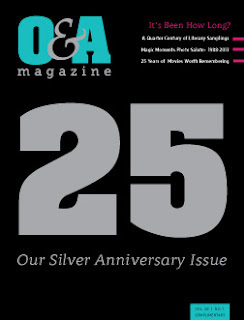 The magazine celebrated its 25th anniversary this month, with a fabulous celebration issue that's as much forward-looking as it is retrospective. It's a fun walk through the magazine's history here, but also shows how much we've accomplished and what we can still do in the years ahead. Check it out here...and maybe read the tiny article about 25 years of the Arts in Wilmo while you're at it. You might recognize the author.